Infinity loses one of its most prominent faces, as creative strategist Robert "FourZeroTwo" Bowling resigns. 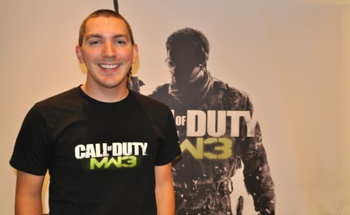 "Today, I resign from my position as Creative Strategist of Call of Duty, as a lead of Infinity Ward, and as an employee of Activision," he wrote. "Creative Strategist" sounds more like a character description than a job title, but apparently Mr. Bowling has been, uh... strategically creating since he joined Activision in 2006 as community manager for the Call of Duty franchise. Since Jason West and Vince Zampella left the company during the great "Where is my money? "-scandal of 2010, Bowling has essentially served as chief hype-man and figurehead/target for the series' fans. You know how on Twitter you occasionally see people shrieking about things like "last stand" and the fact the FAMAS is some kind unstoppable death laser? Chances are they were shrieking at Robert "FourZeroTwo" Bowling. To his credit, not once did he track down one of those complainers and beat them to death with a claw hammer. "We sincerely thank Robert for his many years of service. He's been a trusted and valued member of the Infinity Ward team. We wish him all the best on his decision to pursue future opportunities."